Congratulations to Derek Ward for winning Shane's Rib Shack's FRANCHISEE OF THE YEAR! 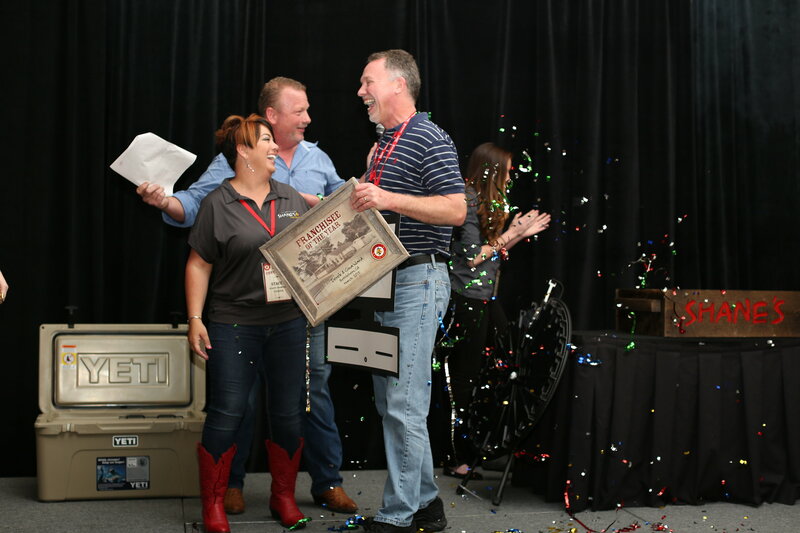 At this year's Franchisee Convention, held at Chataeu Elan Winery and Resort in Braselton, Georgia, Shane's Rib Shack was proud to present many great awards to their franchise owners. The top award, 2015 Franchisee of the Year Award was presented to Bethlehem location owner, Derek Ward! The Wards were chosen as Franchisee of the Year not only based on their high health scores, successful operations, positive restaurant sales but also because of their passion to stay true to what makes Shane's the best! They have continued to to stay true to the values that Shane and Stacey Thompson founded the company on: Food and People! They treat all of their customers like family and give them the each the best experience...the Shane's experience!